Highland is the ideal mix of Eastern and Western influences, combining European design with an American aesthetic. The collection features a gracefully curved back and flared arms creating a unique surface for the herringbone weave pattern. Each piece consists of fully woven panels that are made from weather-resistant resin weave that covers a fully welded, powder coated aluminum frame. Its tapered silhouette and generously scaled deep seating pieces make this simplified design perfect for indoor and outdoor use. The warm colour palette creates a fresh and modern aesthetic. Deep seating pieces include a lounge chair, motion lounge chair, ottoman, loveseat and sofa. Matching occasional, coffee and chat tables feature travertine stone tabletops. All cushions designed to provide the same comfort level as fine residential upholstered furniture offering flexibility and instant recovery. Cushions are made with exclusive Sunbrella<sup></sup> performance fabrics with high quality pigments that result in enduring, consistent and vibrant colours. Inspired by the Provence region of Southern France, Vineyard is fashioned from chateau style manors, with subtle wingback details. Vineyard features a whimsical profile that is suited for country living or chic cottage design with a conscious blend of classical styling and technology. The design combines resin weave and aluminum, two of the most durable and weather resistant materials in the industry. The frames are welded, powder-coated and then meticulously hand-woven with resin weave to simulate the look and feel of real wicker but with added durability. The motion lounge chair includes a hydraulic recliner lift that allows for infinite adjustments. Seating pieces include cafe chair, motion lounge chair, ottoman, loveseat, sofa and infinite adjustable chaise lounge. Matching occasional, cafe and coffee tables accommodate both dining and deep seating. Give your chairs an inviting and refreshed look with this outdoor seat pad from Hampton Bay. Designed in a colourful and elegant pattern, this seat pad is ultra-comfortable with a superior polyfill and durable with outdoor polyester fabric that is UV treated to resist fading. Featuring a clean knife edge to give your chairs a smart look; mix and match with solids, stripes, or patterns for a uniquely coordinated look that is simple to achieve and easy to enjoy. 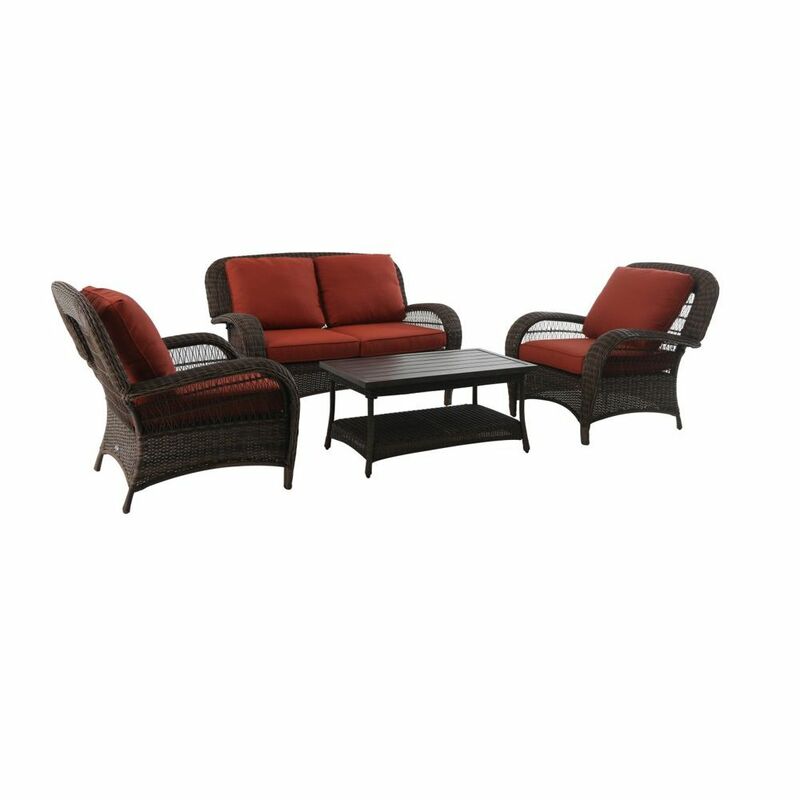 Beacon Park Steel 4 Piece Deep Seating Set Orange - Online Only Relax in style and sophistication, and enjoy the outdoors with the Beacon Park 4-piece chat set. A sturdy, rust-resistant frame supports intricately woven, rich brown wicker, and features a plush olefin seat cushion and back cushion. Wide, curved armrests ensure maximum comfort you won't want to give up. Use as a standalone set, or include other Beacon Park furniture elements to create a complete look.